The study was only a small proof-of-principle test, and its approach is not practical on a large scale. However, it shows that scientists may finally be on the right track to developing an effective vaccine against one of mankind's top killers. A vaccine that uses modified live parasites just entered human testing. "Malaria vaccines are moving from the laboratory into the real world," Dr. Carlos Campbell wrote in an editorial accompanying the study in a recent edition of the New England Journal of Medicine. He works for PATH, the Programme for Appropriate Technology in Health, a Seattle-based global health foundation. The new study "reminds us that the whole malaria parasite is the most potent immunising" agent, even though it is harder to develop a vaccine this way and other leading candidates take a different approach, he wrote. Malaria kills nearly a million people each year, mostly children under five and especially in Africa. 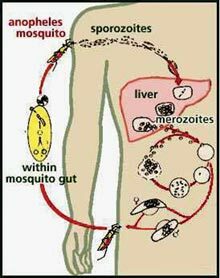 Infected mosquitoes inject immature malaria parasites into the skin when they bite; these travel to the liver where they mature and multiply. From there, they enter the bloodstream and attack red blood cells," the phase that makes people sick. They assigned 10 volunteers to a "vaccine" group and five others to a comparison group. 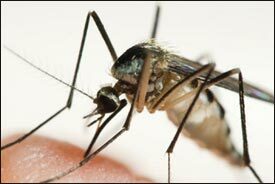 All were given chloroquine for three months, and exposed once a month to about a dozen mosquitoes, malaria-infected ones in the vaccine group and non-infected mosquitoes in the comparison group. That was to allow the "vaccine" effect to develop. Next came a test to see if it was working. The study was done in a lab at Radboud University in Nijmegen, the Netherlands, and was funded by two foundations and a French government grant. "This is not a vaccine" as in a commercial product, but a way to show how whole parasites can be used like a vaccine to protect against disease, said one of the Dutch researchers, Dr. Robert Sauerwein. "It's more of an in-depth study of the immune factors that might be able to generate a very protective type of response," said Dr. John Treanor, a vaccine specialist at the University of Rochester Medical Centre in Rochester, N.Y., who had no role in the study. The concept already is in commercial development. A company in Rockville, Md. Sanaria Inc., is testing a vaccine using whole parasites that have been irradiated to weaken them, hopefully keeping them in an immature stage in the liver to generate immunity but not cause illness. Hobbies: listening to music, reading books. Address: New Puttalam Road, Pandulagama, Anuradhapura, Sri Lanka. Countries preferred from: Sri Lanka, Germany, England, Italy, Australia, India, UK, Newzeland, Nepal. Address: No. 18/2, Epitawatta, Bandarapola, Matale, Sri Lanka. Address: No. 140/5, Wariyapala Sri Sumangala MV, Kandy, Sri Lanka. Address: No. 211, Gongitota, Wattala, Sri Lanka.